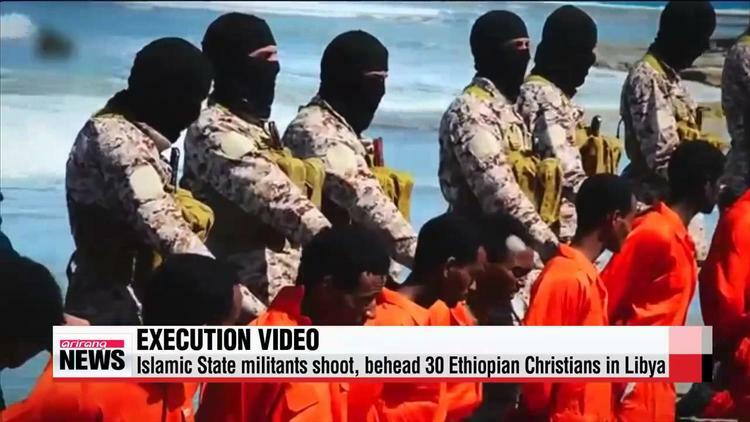 A video purportedly made by Islamic State and posted on social media sites on Sunday (19 April) appeared to show militants shooting and beheading about 30 Ethiopian Christians in Libya. Reuters was unable to verify the authenticity of the video, but the killings resemble past violence carried out by Islamic State, an ultra-hardline group that has expanded its reach from strongholds in Iraq and Syria to conflict-ridden Libya. The video, in which militants call Christians “crusaders” who are out to kill Muslims, showed about 15 men being beheaded on a beach and another group of the same size, in an area of shrubland, being shot in the head. Both groups of men are referred to in a video subtitle as “worshippers of the cross belonging to the hostile Ethiopian church”. Libyan officials were not immediately available for comment. Ethiopia said it had not been able to verify whether the people shown in the video were its citizens. “Nonetheless, the Ethiopian government condemns the atrocious act,” government spokesman Redwan Hussein said. He said Ethiopia, which does not have an embassy in Libya, would help repatriate Ethiopians if they wanted to leave Libya. The EU published a statement by a spokesperson of foreign affairs chief Federica Mogherini, expressing solidarity with Ethiopia “in this moment of shock and grief”. The statement said the situation in Libya will be discussed during today’s Foreign Affairs Council in Luxembourg, where the issue of migrants boat disasters is expected to take centre stage. European Parliament President Martin Schulz has called for the EU to help put in place a government of national unity in Libya. Militants professing loyalty to Islamic State have claimed responsibility for several attacks on foreigners in Libya this year, including an assault on the Corinthia Hotel in Tripoli and the beheading of 21 Egyptian Christians in February. The killing of the Egyptians prompted Egyptian President Abdel Fattah al-Sisi to order air strikes on Islamic State targets in Libya. In the latest video, a man dressed in black clutching a pistol stood behind some of the victims. The video warns that Christians will not be safe unless they embrace Islam or pay protection money. Islamic State controls large parts of Iraq and Syria and wants to redraw the map of the Middle East. It is not clear how many fighters it has in Libya, an oil-producing nation. Egyptian security officials estimate that thousands of militants who share Islamic State’s ideology moved from the Sinai Peninsula to Libya after the army toppled President Mohamed Mursi of the Muslim Brotherhood in 2013.